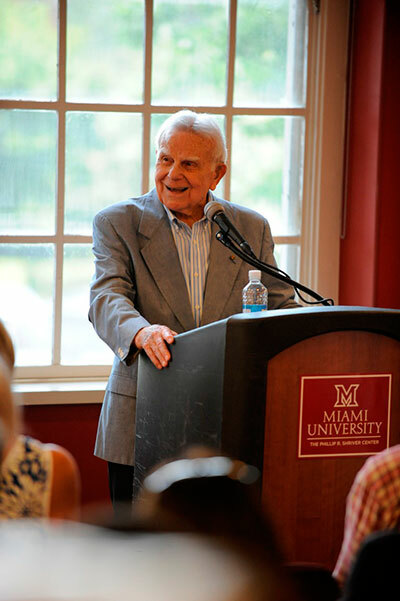 We were saddened to learn of the recent death of John E. Dolibois (Miami University class of 1942), formerly Vice-President of Miami University and United States Ambassador to Luxembourg. Ambassador Dolibois was a good friend of the Michael J. Colligan History Project and spoke to our audience on several memorable occasions, sharing his thoughts and reflections on World War Two and its legacy. In 2002, he was awarded the inaugural John E. Dolibois History Prize, given for substantial and sustained efforts to promote historical teaching and learning in the community and throughout the nation. Born in Luxembourg in 1918, Dolibois emigrated to America with his father in 1931. In 1942, he left a job at Procter & Gamble to enlist in the US Army, serving with distinction in World War Two. Assigned to military intelligence due to his fluency in French and German, Dolibois became the last surviving interrogator of senior Nazi leaders in the Nuremberg War Trials. In 1947, Dolibois was appointed to serve as Miami’s first secretary of the Alumni Association. He later became Vice-President for Development and Alumni Affairs, pioneering alumni clubs across the country, expanding the alumni magazine, creating numerous donor projects, the Alumni Merit Scholarships, endowed professorships, and the Alumni College program. In 1981, Dolibois was appointed United States Ambassador to Luxembourg by President Ronald Reagan, serving his adopted country in that position until retirement in 1985. A series of interviews with John Dolibois and his wife Winnie, completed for the Miami Stories Oral History Project, show the passion, humor, conviction, loyalty, and humanity of this prominent American. Do you have any anecdotes, memories, or tributes to Ambassador Dolibois? Please share them by commenting on this post!